AMOLED (active-matrix organic light-emitting diode, /ˈæmoʊˌlɛd/) is a display device technology used in smartwatches, mobile devices, laptops, and televisions. OLED describes a specific type of thin-film-display technology in which organic compounds form the electroluminescent material, and active matrix refers to the technology behind the addressing of pixels. An AMOLED display consists of an active matrix of OLED pixels generating light (luminescence) upon electrical activation that have been deposited or integrated onto a thin-film transistor (TFT) array, which functions as a series of switches to control the current flowing to each individual pixel. Typically, this continuous current flow is controlled by at least two TFTs at each pixel (to trigger the luminescence), with one TFT to start and stop the charging of a storage capacitor and the second to provide a voltage source at the level needed to create a constant current to the pixel, thereby eliminating the need for the very high currents required for passive-matrix OLED operation. TFT backplane technology is crucial in the fabrication of AMOLED displays. In AMOLEDs, the two primary TFT backplane technologies, polycrystalline silicon (poly-Si) and amorphous silicon (a-Si), are currently used offering the potential for directly fabricating the active-matrix backplanes at low temperatures (below 150 °C) onto flexible plastic substrates for producing flexible AMOLED displays. Manufacturers have developed in-cell touch panels, integrating the production of capacitive sensor arrays in the AMOLED module fabrication process. In-cell sensor AMOLED fabricators include AU Optronics and Samsung. Samsung has marketed its version of this technology as "Super AMOLED". Researchers at DuPont used computational fluid dynamics (CFD) software to optimize coating processes for a new solution-coated AMOLED display technology that is competitive in cost and performance with existing chemical vapor deposition (CVD) technology. Using custom modeling and analytic approaches, Samsung has developed short and long-range film-thickness control and uniformity that is commercially viable at large glass sizes. AMOLED displays provide higher refresh rates than passive-matrix,[not specific enough to verify] often reducing the response time to less than a millisecond, and they consume significantly less power. This advantage makes active-matrix OLEDs well-suited for portable electronics, where power consumption is critical to battery life. The amount of power the display consumes varies significantly depending on the color and brightness shown. As an example, one commercial QVGA OLED display consumes 0.3 watts while showing white text on a black background, but more than 0.7 watts showing black text on a white background, while an LCD may consume only a constant 0.35 watts regardless of what is being shown on screen. Because the black pixels turn completely off, AMOLED also has contrast ratios that are significantly higher than LCD. AMOLED displays may be difficult to view in direct sunlight compared with LCDs because of their reduced maximum brightness. Samsung's Super AMOLED technology addresses this issue by reducing the size of gaps between layers of the screen. Additionally, PenTile technology is often used for a higher resolution display while requiring fewer subpixels than needed otherwise, sometimes resulting in a display less sharp and more grainy than a non-PenTile display with the same resolution. The organic materials used in AMOLED displays are very prone to degradation over a relatively short period of time, resulting in color shifts as one color fades faster than another, image persistence, or burn-in. As of 2010, demand for AMOLED screens was high and, due to supply shortages of the Samsung-produced displays, certain models of HTC smartphones were changed to use next-generation LCD displays from the Samsung-Sony joint-venture SLCD in the future. Flagship smartphones sold as of December 2011 used either Super AMOLED or IPS panel premium LCD. Super AMOLED displays, such as the one on the Galaxy Nexus and Samsung Galaxy S III have often been compared to IPS panel premium LCDs, found in the iPhone 4S, HTC One X, and Nexus 4. For example, according to ABI Research the AMOLED display found in the Motorola Moto X draws just 92 mA during bright conditions and 68 mA while dim. On the other hand, compared with the IPS, the yield rate of AMOLED is low; the cost is also higher. "Super AMOLED" is a marketing term created by device manufacturers for an AMOLED display with an integrated digitizer: the layer that detects touch is integrated into the screen, rather than overlaid on top of it. The display technology itself is not improved. According to Samsung, Super AMOLED reflects one-fifth as much sunlight as the first generation AMOLED. Super AMOLED is part of the Pentile matrix family, sometimes abbreviated as SAMOLED. For the Samsung Galaxy S III, which reverted to Super AMOLED instead of the pixelation-free conventional RGB (non-PenTile) Super AMOLED Plus of its predecessor Samsung Galaxy S II, the S III's larger screen size encourages users to hold the phone further from their face to obscure the PenTile effect. Super AMOLED Advanced is a term marketed by Motorola to describe a brighter display than Super AMOLED screens, but also a higher resolution — qHD or 960×540 for Super AMOLED Advanced than WVGA or 800×480 for Super AMOLED and 25% more energy efficient. Super AMOLED Advanced features PenTile, which sharpens subpixels in between pixels to make a higher resolution display, but by doing this, some picture quality is lost. This display type is used on the Motorola Droid RAZR and HTC One S.
Super AMOLED Plus, first introduced with the Samsung Galaxy S II and Samsung Droid Charge smartphones, is a branding from Samsung where the PenTile RGBG pixel matrix (2 subpixels) used in Super AMOLED displays has been replaced with a traditional RGB RGB (3 subpixels) arrangement typically used in LCDs. This variant of AMOLED is brighter and therefore more energy efficient than Super AMOLED displays and produces a sharper, less grainy image because of the increased number of subpixels. In comparison to AMOLED and Super AMOLED displays, they are even more energy efficient and brighter. However, Samsung cited screen life and costs by not using Plus on the Galaxy S II's successor, the Samsung Galaxy S III. HD Super AMOLED is a branding from Samsung for an HD-resolution (above 1280×720) Super AMOLED display. The first device to use it was the Samsung Galaxy Note. The Galaxy Nexus and the Galaxy S III both implement the HD Super AMOLED with a PenTile RGBG-matrix (2 subpixels/pixel), while the Galaxy Note II uses an RBG matrix (3 subpixels/pixel) but not in the standard 3 stripe arrangement. A variant of the Samsung Galaxy S3 using Tizen OS 1 was benchmarked using a non-pentile HD Super AMOLED Plus screen in 2012. As featured on the Samsung Galaxy S4, Samsung Galaxy S5, and Samsung Galaxy Note 3, this display has a 1920×1080 resolution that is better known as 1080p. It has a color gamut of up to 97% of the Adobe RGB color space. Quad HD Super AMOLED technology was first used by AU Optronics in April 2014. After AU Optronics released their phone which used a Quad HD Super AMOLED screen, other companies such as Samsung released phones utilizing the technology such as the Samsung Galaxy Note 4 and Samsung Galaxy Note 5 Broadband LTE-A and Samsung Galaxy S6 and S7. Future displays exhibited from 2011 to 2013 by Samsung have shown flexible, 3D, unbreakable, transparent Super AMOLED Plus displays using very high resolutions and in varying sizes for phones. These unreleased prototypes use a polymer as a substrate removing the need for glass cover, a metal backing, and touch matrix, combining them into one integrated layer. Also planned for the future are 3D stereoscopic displays that use eye tracking (via stereoscopic front-facing cameras) to provide full resolution 3D visuals. Below is a mapping table of marketing terms versus resolutions and sub-pixel types. Note how the pixel density relates to choices of sub-pixel type. ^ Lee, Hyunkoo; Park, Insun; Kwak, Jeonghun; Yoon, Do Y.; Kallmann, Changhee Lee (2010). "Improvement of electron injection in inverted bottom-emission blue phosphorescent organic light emitting diodes using zinc oxide nanoparticles". Applied Physics Letters. 96: 153306. doi:10.1063/1.3400224. ^ Kim, Yang Wan; Kwak, Won Kyu; Lee, Jae Yong; Choi, Wong Sik; Lee, Ki Yong; Kim, Sung Chul; Yoo, Eui Jin (2009). "40 Inch FHD AM-OLED Display with IR Drop Compensation Pixel Circuit". SID Symposium Digest of Technical Papers. 40: 85. doi:10.1889/1.3256930. ^ Lee, Myung Ho; Seop, Song Myoung; Kim, Jong Soo; Hwang, Jung Ho; Shin, Hye Jin; Cho, Sang Kyun; Min, Kyoung Wook; Kwak, Won Kyu; Jung, Sun I; Kim, Chang Soo; Choi, Woong Sik; Kim, Sung Cheol; Yoo, Eu Jin (2009). "Development of 31-Inch Full-HD AMOLED TV Using LTPS-TFT and RGB FMM". SID Symposium Digest of Technical Papers. 40: 802. doi:10.1889/1.3256911. ^ Hamer, John W.; Arnold, Andrew D.; Boroson, Michael L.; Itoh, Masahiro; Hatwar, Tukaram K.; Helber, Margaret J.; Miwa, Koichi; Levey, Charles I.; Long, Michael; Ludwicki, John E.; Scheirer, David C.; Spindler, Jeffrey P.; Van Slyke, Steven A. (2008). "System design for a wide-color-gamut TV-sized AMOLED display". Journal of the Society for Information Display. 16: 3. doi:10.1889/1.2835033. ^ "Introduction to OLED Displays – Design Guide for Active Matrix OLED (AMOLED) Displays" (PDF). 4D Systems. 22 May 2008. Archived from the original (PDF) on 5 July 2010. Retrieved 6 September 2010. ^ Lin, Chih-Lung; Chen, Yung-Chih. "A Novel LTPS-TFT Pixel Circuit Compensating for TFT Threshold-Voltage Shift and OLED Degradation for AMOLED". IEEE Electron Device Letters. 28: 129. doi:10.1109/LED.2006.889523. ^ Reid Chesterfield, Andrew Johnson, Charlie Lang, Matthew Stainer, and Jonathan Ziebarth, "Solution-Coating Technology for AMOLED Displays Archived 16 May 2011 at the Wayback Machine", Information Display Magazine, January 2011. ^ Suyko, Alan. "Oleds Ready For The Mainstream." Electronics News (2009): 20. Associates Programs Source Plus. Web. 9 Dec. 2011. ^ Mian Dong; Choi, Y.-S.K; Lin Zhong (July 2009). "Power modeling of graphical user interfaces on OLED displays". Design Automation Conference, 2009. DAC '09. 46th ACM/IEEE. IEEE: 652–657. ^ "AMOLED vs LCD: differences explained". Android Authority. Archived from the original on 27 December 2016. Retrieved 6 February 2017. ^ Tim CarmodyEmail Author. 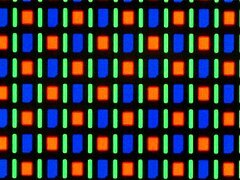 "How Super AMOLED displays work". Wired.com. Archived from the original on 28 September 2012. Retrieved 10 October 2012. ^ "What Are The Benefits Of Using The Super AMOLED Display In My SGH-t959 (Vibrant) Phone?". Samsung. 15 July 2010. Archived from the original on 16 July 2011. Retrieved 7 September 2010. ^ "Big is beautiful". The Age. 12 August 2010. Archived from the original on 29 August 2010. Retrieved 7 September 2010. ^ Ashtiani, Shahin J.; Reza Chaji, G.; Nathan, Arokia. "AMOLED Pixel Circuit With Electronic Compensation of Luminance Degradation". Journal of Display Technology. 38: 36. doi:10.1109/JDT.2006.890711. ^ "Archived copy". Archived from the original on 7 September 2012. Retrieved 16 December 2012. CS1 maint: Archived copy as title (link) Construction of new production facilities in 2011 was expected to increase the production of AMOLED screens to cope with demand. ^ "AMOLED vs LCD: Which screen is best for your phone?". digitaltrends.com. 29 August 2014. Archived from the original on 29 March 2018. Retrieved 6 May 2018. ^ a b "Smartphone screens explained: display types, resolutions and more - AndroidPIT". androidpit.com. Archived from the original on 12 May 2015. Retrieved 6 May 2018. ^ "Nexus 4 Review: Not Exactly Perfect, But Close Enough For Me – TechCrunch". techcrunch.com. Archived from the original on 7 February 2018. Retrieved 6 May 2018. ^ a b "Galaxy Note 2: Display hat keine PenTile-Matrix | BestBoyZ". Bestboyz.de. 30 August 2012. Archived from the original on 10 October 2012. Retrieved 10 October 2012. ^ "Samsung Smartphones | Technology". Samsung.com. 6 January 2012. Archived from the original on 27 June 2012. Retrieved 10 October 2012. ^ "Super AMOLED". Oled-info.com. Archived from the original on 9 October 2012. Retrieved 10 October 2012. ^ Sakr, Sharif (25 March 2012). "Samsung Galaxy S III review". Engadget. Archived from the original on 26 January 2013. Retrieved 6 February 2013. ^ "Super AMOLED Advanced". Archived from the original on 24 March 2014. Retrieved 24 March 2014. ^ "DROID RAZR – Thinnest 4G LTE Android Smartphone – Motorola Mobility LLC. USA". Archived from the original on 30 November 2012. Retrieved 27 November 2012. ^ "www.oled-info.com/super-amoled-plus". OLED-Info. Archived from the original on 16 August 2011. Retrieved 23 August 2011. ^ "WiFi Alliance certificate teases Tizen flavored Samsung Galaxy S III". engadget.com. Archived from the original on 11 October 2016. Retrieved 6 May 2018. ^ "UL certifies Samsung's Full HD AMOLED Display - Sammy Hub". sammyhub.com. 10 June 2013. Archived from the original on 13 November 2017. Retrieved 6 May 2018. ^ "Galaxy S4 Display Technology Shoot-Out". www.displaymate.com. Archived from the original on 3 October 2017. Retrieved 6 May 2018. ^ "The first Quad HD AMOLED screen is here, but it's not from Samsung". androidauthority.com. 11 April 2014. Archived from the original on 16 August 2017. Retrieved 6 May 2018. ^ "Samsung teases flexible, transparent display in concept video". engadget.com. Archived from the original on 11 October 2016. Retrieved 6 May 2018. ^ "Samsung names flexible OLED display series 'Youm', shows new prototype handheld device". engadget.com. Archived from the original on 16 February 2018. Retrieved 6 May 2018. ^ Kelly, Gordon. "Samsung Report 'Confirms' Significant Galaxy S9 Design Changes". forbes.com. Archived from the original on 1 April 2018. Retrieved 6 May 2018. ^ "HTC VIVE Focus". vive.com. Archived from the original on 13 December 2017. Retrieved 13 December 2017. This page was last edited on 12 April 2019, at 14:41 (UTC).